Nothing conveys a warm, inviting atmosphere quite like the high-quality look of solid cedar wood. 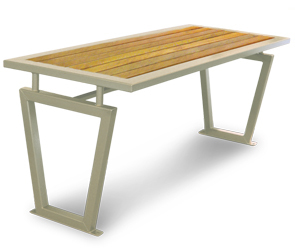 This wooden table framed with durable powder-coated steel is a matching piece to the Decora style benches, and it looks great with either one of them, with backrest or backless. Feel free to mix and match. You can rest assured knowing that the cedar wood slats will stay at a comfortable temperature all summer long. Cedar is naturally resistant to fungus and bacteria, and has a pleasant aroma that also acts as a bug repellant. The natural color of cedar will weather beautifully to a rich silver/gray or it can be stained or varnished. 3" x 1-1/2" x 1/8" Steel Table Top. 2" x 2" x 1/8" Steel Frame.